(Nanowerk News) Detecting biomolecules, such as lipids, proteins, and nucleic acids and their interactions in heterogeneous biological samples is crucial for understanding a multitude of biological mechanisms in health and disease. For instance, molecular signaling and transport in cells are governed by the association and insertion of proteins with the cell lipid membrane. However, current label-free techniques struggle to differentiate protein insertion, chemical release and membrane disruption processes, thus forcing experimentalists to rely on multiple techniques that usually require different experimental settings. It is therefore essential to develop new biosensors with high sensitivity and selectivity that are capable of leveraging the chemical signature of different biomolecular species to enable investigation of complex multi-analyte interactions. 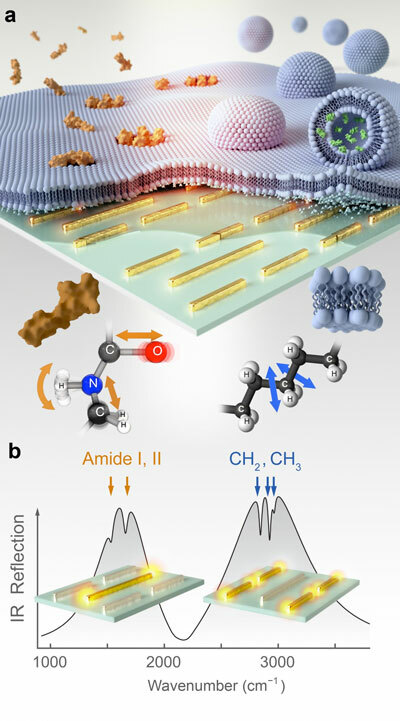 In a study published in Nature Communications ("Resolving molecule-specific information in dynamic lipid membrane processes with multi-resonant infrared metasurfaces"), researchers at Ecole Polytechnique Fédérale de Lausanne (Switzerland) and their colleagues from the USA introduce a mid-infrared biosensor based on a novel multi-resonant metasurface, which, for the first time, is able to distinguish multiple analytes in heterogeneous biological samples non-destructively, in real-time and with high sensitivity. The new sensor achieves this by accessing the distinct chemical fingerprint information of proteins, lipids, peptides, or other biochemical and allows simultaneous and independent monitoring of their interaction dynamics. In particular, the study shows that the sensor can spectroscopically resolve the interaction of biomimetic lipid membranes with different peptides as well as the dynamics of vesicular cargo release. These are biologically important mass-preserving processes that are inaccessible to standard label-free techniques, regardless of their sensitivity. Strikingly, the sensor can resolve the interaction of lipid membranes with a toxic pore-forming peptide such as melittin, both in supported membranes and surface-tethered vesicles loaded with neurotransmitter molecules. The study shows monitoring of melittin-induced membrane disruption and neurotransmitter cargo release from such synaptic vesicle mimics in real time, with monolayer sensitivity, and without labeling. These important proof of concept experiments pave the way for applying these biosensors to investigate the molecular mechanisms underpinning important processes that have been linked to human diseases, such pore formation and membrane disruption induced by protein aggregation in neurodegenerative diseases such as Alzheimer's and Parkinson's disease.